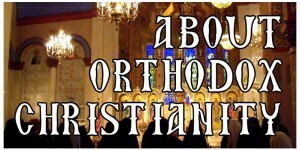 This page gives an introduction and answers some of the most common questions about the differences between Roman Catholicism and Orthodox Christianity. If you have a question that is not answered here, or want more in-depth information, please contact us. You may also find some helpful information comparing Orthodoxy with Roman Catholicism in our pastor Fr. Andrew Stephen Damick‘s “Orthodoxy and Heterodoxy” in either its podcast or book form. For a Roman Catholic walking into an Orthodox church, there will be many elements that are familiar—services led by an ordained priesthood, sacramental worship, ancient tradition, Christian art, etc. But Orthodoxy also has much that is unfamiliar—a mostly married priesthood, communing infants, no papacy, and so forth. It is also likely that an Orthodox church will be a riot of color in comparison with the simpler statuary of Rome’s churches. But beyond these initial impressions, there is actually much that continues to separate Rome from Orthodoxy. One of the most common mistakes is an assumption that surface similarities mean that there really isn’t any major difference between Roman Catholicism and Orthodoxy. What is necessary for unity between Rome and the Orthodox Churches? Orthodox Christians and Roman Catholics see the answer to this question quite differently. From the Orthodox point of view, Roman Catholics would be expected to return to the Orthodox faith that the Church of Rome professed during the period before it broke from Orthodoxy in roughly the 11th century (the Great Schism). By contrast, Rome’s primary expectation of the Orthodox is that they would accept the sovereignty of the Pope over all their churches. Orthodox Christians cannot accept that condition, however, as they would understand it to mean an abandonment of the faith that they had received from the Apostles. From Orthodoxy’s point of view, it is Rome who has left the tradition of the Apostles and introduced new teachings, such as Papal Infallibility, Purgatory and the Immaculate Conception, not to mention unilaterally altering the Nicene Creed to add the word Filioque (“and the Son”) to the phrase concerning the procession of the Holy Spirit, a term that was not in the original version of the Creed agreed upon by Rome with the eastern churches. Make no mistake: Orthodox Christians genuinely desire union with Roman Catholics, but it is the same union that they desire with all Christians and, indeed, with all human beings—union in the Orthodox Christian faith given by Christ once for all to the Apostles. There is much we have in common and can affirm together, but there are also significant differences that continue to make unity not yet possible. How is Orthodox worship different from Roman Catholic worship? Even prior to the 1960s, the Eastern Christian liturgical tradition was different from the Western Christian tradition represented by Rome. Even then, it was far more complex and multi-vectored (i.e., multiple things going on at the same time), a difference which has become more pronounced since the major liturgical changes beginning in the 1960s and continuing since then for Roman Catholics. Orthodoxy has not made any similar alteration to its mode of worship. While Orthodox worship has changed somewhat over the centuries, the changes have been extremely gradual and comparatively minor. Orthodox worship has never been modernized and continues much as it has for centuries. Regarding the language of worship, Orthodoxy never had a single liturgical language like Rome did with Latin prior to the 1960s. The language of worship has generally been the local language. In the case of some parishes in America with many immigrants, it is possible that one will hear a language in addition to English used in worship as part of the ministry to those immigrants. Do Orthodox Christians pray the Rosary? The Rosary dates from the 1400s, well after the split between Rome and the Orthodox Church, so the use of the Rosary is unknown in Orthodoxy. In Orthodoxy there is, however, the similar practice of praying the Jesus Prayer (“Lord Jesus Christ, Son of God, have mercy on me”) with a knotted prayer rope (or sometimes with beads). Other brief prayers may also be associated with the use of the prayer rope, though there is not any corresponding system of imaginative systems of meditations as there sometimes is in Roman Catholicism. Purgatory was developed in 12th century Roman Catholic theology to explain how the dead can work off the residual debt accrued from sin prior to the Second Coming. The teaching is that the slate needs to be clean before a person can come before the Judgement Seat, that “satisfaction” must be made either in this life or in the intermediary state of Purgatory before entering the Kingdom of Heaven. The Orthodox view of salvation is more process-oriented, and does not believe that sin and grace are quantifiable substances that must somehow be in balance before someone can enter God’s Kingdom. We also do not believe that “satisfaction” can be made for sins. God does not need to be satisfied but instead desires to heal us of our sins. He is not holding anything against us. There is just sin, and although some are more serious than others, Orthodox do not make the distinction between mortal and venial sins that Roman Catholics do. All sin is believed to be serious in Orthodoxy. We progress toward holiness (deification or theosis), and this is a process that will not be completed in this lifetime. Indeed, the work of holiness is an eternal one, since God’s holiness is limitless. So we are in the middle of the process of sanctification at the moment of our deaths. How will we know we are ready? It is our jobs to make sure we are prepared for our deaths, and to make sure that we have spent a life working toward holiness. As a consequence of these differences, the doctrine of Purgatory is absent from Orthodoxy, just as it is absent from the faith of Rome prior to its introduction in the 12th century. Orthodox Christians and Roman Catholics both believe in the real presence of Christ in the Eucharist. So does Orthodoxy believe in transubstantiation? Transubstantiation as a Roman Catholic doctrine is the use of Aristotelian philosophical categories of “substance” (what makes a thing what it is) and “accidents” (incidental attributes of a thing) to explain how it is that the bread and wine of the Eucharist still appear to be bread and wine (in their “accidents”) while having undergone a change in their “substance” to be the Body and Blood of Christ. This explanation goes beyond simply stating that the bread and wine become the Body and Blood. Orthodox Christians believe in the Real Presence and accept it as a mystery. Western theology tends to approach theological matters via the use of reason; this is a legacy of Augustinianism and the medieval Scholastics, who applied the techniques of Greek philosophy to the investigation of theological matters. Orthodoxy believes that certain matters are beyond the use of reason, so it is presumptuous for us as limited human beings to think that we can use our reason to understand that which is beyond us. As a consequence, we Orthodox are comfortable with accepting mysteries like the Real Presence as what they are—mysteries, without feeling obliged to explain them. Can Roman Catholics receive communion at an Orthodox church? Yes, but like anyone else, they must first go through the process of joining the Orthodox Church, which involves setting aside former church memberships. Non-Orthodox Christians of any sort may not receive communion at an Orthodox church without doing this. There are no “walk-ins” for communion. At the same time, Orthodox Christians are also not permitted to commune anywhere but in an Orthodox church, and they also have to be prepared by prayer, fasting and a recent confession. Why do the Orthodox seem to be fasting all the time? In former centuries, Roman Catholic fasting and other asceticism was in most respects quite similar to Orthodoxy—nearly half the days of the year were fasting days! This kind of practice really is part of Roman Catholic tradition, as well, but it has largely been almost completely abandoned in our own day. It is now rare to find a Roman Catholic who goes without meat on Fridays in Lent, something that was normal even just a few decades ago. Fasting is one of many tools that we use to bring our bodies “under subjection” as St. Paul said (I Cor. 9:27), so that we might be pure and holy. Jesus said that when He had gone, His followers would fast. Like the early Christians, we fast so that we may learn to control our appetite for all things that are not good and holy. It is not about earning salvation, it is a tool to help us work out our salvation with fear and trembling (Phil. 2:12), enabling us to train and strengthen our wills so that they can be turned toward Christ. Specifically, we fast each Wednesday to commemorate the day when Jesus was betrayed and each Friday to commemorate His death on the cross. In addition, we fast during the entire Lenten period and the entire Advent period, as well as during other times during the year. Orthodox fasting practice, when followed strictly, means that the believer does not partake of any animal products from vertebrates (i.e., no meat, dairy, eggs, etc. ), nor of olive oil nor wine. These choices reflect the desire to do no harm on these days, as well as giving up certain staples of life. What is the Orthodox view of Original Sin? The Western Christian doctrine of Original Sin, formulated originally by St. Augustine, presumes that we inherit Adam’s guilt. This is the consequence of a mistranslation in St. Jerome’s Latin Vulgate of Romans 5, which is the version of the New Testament that Augustine used in formulating his doctrine. Orthodox believe that we inherit Adam’s mortality, not Adam’s guilt. That is, Orthodoxy is concerned with the actual state of man’s body and soul, not just his legal standing before God. That said, not all Roman Catholic theology (especially official dogma) has tended to this strong contrast toward favoring the “guilt” model, and Orthodoxy and Roman Catholicism are sometimes understood as not being far from each other in this regard. Why don’t Orthodox believe in the Immaculate Conception? Mary (like all of us) was born mortal as a result of the Fall. But for Roman Catholics, a special conception for Mary was necessary so that Christ could be born to a spotless vessel—she was therefore declared in 1854 to have been conceived without “the stain of original sin.” So the Immaculate Conception is a natural consequence of the Augustinian doctrine of Original Sin in the West, but is not needed in Orthodoxy to explain how mortal Mary could have given birth to a perfect Son. For the Orthodox, Christ’s perfection in His humanity is the result of its union with His divinity, not a result of having been born of an immaculately conceived mother. At the same time, while both Roman Catholics and Orthodox Christians believe in the Virgin Mary’s great holiness (perhaps even to the point of sinlessness), for Roman Catholics, this holiness is the result of the Immaculate Conception; that is, she could not have sinned. But for Orthodox Christians, her holiness is the result of struggle against the passions that beset all human beings after the Fall. It is far more laudable to be holy when one doesn’t have to be. What are the differences in belief regarding the Assumption of Mary? Roman Catholics believe that Mary, because she was born without the stain of Original Sin (see the previous question on the Immaculate Conception), did not have to die; as a consequence, she is the only human being to be assumed directly to heaven without passing through death. On the other hand, Orthodox Christians believe that Mary inherited Adam’s mortality like all other human beings, and therefore died like the rest of us. However, her Son (the new Adam) immediately raised her from the dead as one of the first fruits of his Redemption, and she was then assumed into heaven. This is why the icon of the Virgin Mary’s death (her “Dormition”) shows her lying on her death bed, with her Son behind her holding a baby in swaddling clothes. The baby represents His mother’s soul whom he has raised to her life with Him in heaven. Each August 15, the Orthodox celebrate Mary’s Dormition (“falling asleep”) rather than her Assumption. Thus, both Roman Catholics and Orthodox Christians believe that the Virgin’s body is assumed into Heaven, but Orthodox Christians believe that the process included her death. It can mean “Mother of God,” but its literal sense is “birth-giver to God.” The title was given to Virgin Mary at the Third Ecumenical Council in Ephesus in 431, to affirm that in the Incarnation God was truly born of a mortal woman. It’s a title that Roman Catholics as well as Orthodox can proclaim! Why are Orthodox priests allowed to marry? Orthodox clergy—bishops, priests and deacons—are not allowed to marry after ordination (in some traditions, this applies to ordination of subdeacons), though married men can be ordained as deacons and priests. (Bishops are celibates and often monastics.) The decision to marry or not must be made prior to ordination, and in the event of the death of his wife, an ordained clergyman may not remarry unless he permanently leaves the diaconate or priesthood. It was at the First Lateran Council in 1123 (after the Great Schism) that celibacy became mandatory for Roman Catholic priests. Before this, a local council in Elvira, Spain, in 316 declared that celibacy was mandatory for clergy, and the practice began to spread in the West over the following centuries under the encouragement of various popes. Orthodox have always insisted that celibacy had traditionally been optional for clergy since the first century, citing scriptural and other evidence for married priests and bishops (e.g., Mark 1:30, I Timothy 3:1-5). Also, the decisions of local councils are not binding on the Church as a whole; only the decisions of Ecumenical Councils are universally binding. As is the case in the West, bishops have been celibate in Orthodoxy since the 5th century, a canon law instituted initially to halt the loss of land holdings to the descendants of married bishops. Note, too, that all monastics are celibate in the Orthodox Church. Also, celibacy has always been understood as a tradition rather than as unchangeable doctrine for Rome, which is why there have been exceptions made to Roman Catholic priestly celibacy, especially in recent years. There are no doctrinal reasons why a married priesthood could not be restored by Rome. Both Orthodox Christians and Roman Catholics make the Sign of the Cross, but why is the order different (Orthodox start with their right shoulder, but Roman Catholics start with their left)? The sign of the cross is a tradition dating back at least to the 2nd century and is made by many Christians. There are a number of theories as to why there are some differences on this, but none have really been satisfactorily proven from historical data. It’s worth noting that some of the other historical Eastern churches, such as the Copts and the Armenians, make the sign of the cross roughly similar to Roman Catholics. Roman Catholics make the sign of the cross with the five fingers next to each other, to represent the five wounds of Christ (head, hand, hand, torso, feet). Orthodox make the sign of the cross with the thumb, index, and middle fingers together, representing the Trinity, and the fourth and fifth fingers pressed into the palm to represent the two natures of Christ. There is no major doctrinal problem here between Orthodoxy and Rome. Why are Orthodox children allowed to partake in Communion, but Catholic children have to wait until 1st or 2nd grade? Roman Catholic doctrine holds that a child must be old enough intellectually to understand the mystery of Christ according to “his capacity.” He should be able to discern the difference between the Eucharist and ordinary bread. Western doctrine places a premium on the role of reason in understanding God and in forming a relationship with Him. Orthodoxy, on the other hand, believes that God in His Essence is unknowable, and dwells in “divine darkness.” No one will ever apprehend the mysteries of God, the Incarnation, or the Eucharist through reason. Why, then, withhold the grace of the sacrament from those whose understanding is after all only a little less than an adult’s? As a consequence, Orthodox do not believe in holding back children (or those who who are developmentally challenged and may be permanently incapable of reason) from receiving the Body and Blood of Christ. As with certain other practices, the delay of communion (and confirmation, as well) is something that developed gradually over time for Roman Catholics. Ancient Roman practice was nearly identical in this regard to Orthodoxy—baptism, confirmation (chrismation) and communion were all given to infants. This is still the practice of the Eastern Catholic churches, which resemble Orthodoxy in many ways but belong to Rome. What is the difference between Roman Catholicism and Orthodoxy in canonizing saints? For Rome, the declaration of a saint is a more-or-less top-down process; by recognition of miracles by the hierarchy, analysis of the prospective saint’s life under the direction of the hierarchy; and the juridical approach involving a “Devil’s Advocate.” For Orthodoxy, a saint is recognized as such by more of a bottom-up process: the community recognizes the saint’s holiness, which is then investigated, acknowledged and proclaimed by the hierarchy. Why does the Orthodox Church use leavened bread and the Roman Catholic Church use unleavened bread (wafers)? The differences between Orthodoxy and Roman Catholicism on the use of bread in the Eucharist arose because of differences in understanding of the nature of the Last Supper (as a fellowship meal per the Gospel of John in the Orthodoxy, as a Passover meal per the synoptic gospels in Roman Catholicism), and perhaps also of the theological symbolism of leaven. The Orthodox have generally maintained the symbolism of “risen bread to signify the risen Christ.” This difference was an issue of major controversy around the time of the Great Schism, though it is less discussed today. Why do Orthodox Christians say that the Holy Spirit proceeds only from the Father, rather than from the Father and the Son? The formulation in the Nicene-Constantinopolitan Creed, which represents the faith passed down from the Apostles, did not originally include “and the Son” (in Latin, filioque). It agrees with the theology of Scripture: the Gospel of John quotes Christ Himself in saying “But when the Comforter comes, whom I shall send to you from the Father, the Spirit of truth who proceeds from the Father, He will testify of Me.” (John 15:26). The filioque clause was introduced in the West at a local council in Toledo, Spain, in 589. Over the coming centuries, it would spread in the West as theology (under the influence of Charlemagne’s Frankish theologians) drifted from a common understanding with the East. In the year 1274, a council of the Roman Catholic Church in Lyons, France made the filioque an official part of the Nicene Creed in the West. Besides its disagreement with the words of Christ and its contradiction with the original Creed, the filioque also results in a subordination of the Holy Spirit: If two Persons of the Trinity (the Father and Son) share on thing that the third Person (the Holy Spirit) lacks, then how can the Spirit truly be equal to the Father and Son? Orthodoxy sees rather a perfect balance in the Trinity: Anything that can be said of God is either equally applicable to all three Persons or uniquely applicable to only one Person. How do Orthodox Christians view the authority of the Pope, and the Primacy of Peter? The Patriarchate of Rome is one of the five historic patriarchates of the Church, the others being Constantinople, Alexandria, Antioch and Jerusalem. Orthodox accorded the Pope of Rome the respect due the “first among equals” prior to the Great Schism. The Orthodox agree that, historically, there was a primacy accorded the Pope of Rome. However, Orthodoxy holds that primacy was always understood as a primacy of honor and coordination rather than a primacy of sovereign authority. For the Orthodox, all bishops are fundamentally equal. Roman Catholic theologians would counter that the understanding of the special status of papacy evolved over time in the West under the influence of the Holy Spirit; Orthodoxy would insist that the authority granted the first bishops, the apostles, was granted once and for all, and that the revelation of authority in them within the Body of Christ does not evolve over time. Orthodoxy also believes that all Orthodox bishops are the successors of Peter and that Rome’s pope cannot hold this status uniquely. Why did the Orthodox Church split off from the Roman Catholic Church? It’s a matter of how you interpret the events of history, isn’t it? From an Orthodox perspective, it’s Rome that left the Orthodox Church over a period of theological drift that spanned centuries. From Rome’s perspective, it’s Orthodoxy that went into schism by refusing to acknowledge the absolute authority of the Papacy. We pray for a healing of this rift, and a restoration of the Patriarchate of Rome to its role as first among equals in the Orthodox Church. Questions and answers expanded and adapted from “For Roman Catholics” and used with permission from St. Peter & St. Paul Orthodox Church, Burr Ridge, Illinois.